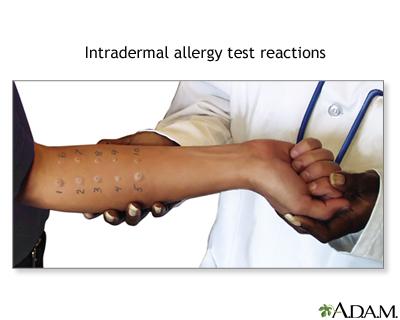 Intradermal allergy testing is another method of skin testing to help determine whether an individual is allergic to a specific allergen. The test involves injection of a small amount of the suspected allergen under the surface of the skin. After about 20 minutes the area is examined for a reaction at the site. A typical reaction looks like a small hive with swelling and redness. The intradermal test is more sensitive than the skin prick test and can usually provide more consistent results.